After hearing about a sale ($50 off their Dell Mini) that Dell was having on their netbook line, I just had to get one. Of course in the process I managed to talk my friend into getting on too. Our plan? To install Mac OS X Leopard on these machines for our very own "ultimate OS X netbooks"! We ordered them at the end of February and just this past Friday (March 20) we got them. Definitely wasn't too happy about having to wait that long, and as of right now I still don't have the 2GB memory chip that I ordered from them. Fortunately I did have an extra 1GB PC-5300 SO-DIMM that I'm using for the time being. I used the guide that Gizmodo wrote up, you can find it by clicking on this link. Pretty much as long as you follow their steps, you'll be up and running in an hour or less. I highly recommend getting an external DVD drive instead of going the route of the flash keys, although if you have to use a flash key make sure you've got at least 2 of them and that one of them at least 8GBs in size, the other one can be small, 512MBs or 1GB. There were a couple things that happened in my install that I think I feel should be mentioned. First the Gizmodo article did mention that the install might fail and although theirs didn't and nor did mine, my friends did. Fortunately I told him that it might happen and not to worry. And of course, I was right, his install worked fine. So if you get a "failed to install" message, don't panic. Just continue to the next step in the guide and it should work fine. The next thing was that upon my first boot into my OS X install, WiFi nor sound didn't work. As per Gizmodo this was was normal too, but after doing a reboot again with the "-f" option it should work. Well I tried that 3-4 times but it failed to get WiFi or the audio working. I did some searching around on the MyDellMini forums and came across a few posts detailing fixes for this issue. What I ended up doing was again booting up using the "-f" option, then I ran the DellEFI application and rebooted. Upon that reboot, my WiFi and sound worked fine. Odd, as it was supposed to work right after install, but either way, I'm happy that it works perfectly fine now. 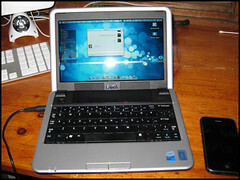 I'm extremely pleased with the Dell Mini 9 as an OS X netbook. It's very easy to get working (so long as you can follow directions and have the right tools), all of the main features (Bluetooth, Airport, screen brightness, sleep, audio, WiFi, Ethernet) are supported almost out of the box. The larger 16GB drive is amazing. Being able to use my retail OS X Leopard disk was great too. Now, my biggest gripe about the Mini is the keyboard. It's absolutely terrible. The keys are small, have odd placement and just all around annoy me. Fortunately I ordered my Mini with a Bluetooth chip installed. I've finally found a use for the $80 Apple keyboard I purchased almost a year ago and barely ever used since then. Bluetooth pairing worked just as if I was on a real Apple machine and took seconds to setup and get working. This is a really great solution for when I'm just sitting at my desk, for when I'm not, I think I'll just have to learn to deal with the built-in keyboard. 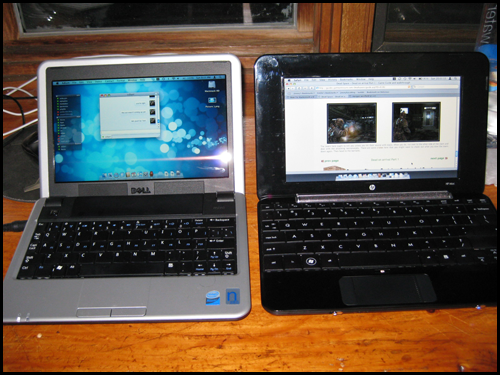 The photo above compares the HP Mini keyboard to the Dell Mini, I much prefer the HP to the Dell. If the audio had worked in the HP I would probably be using that instead of the Dell. Both the Dell and the HP are relatively the same size. 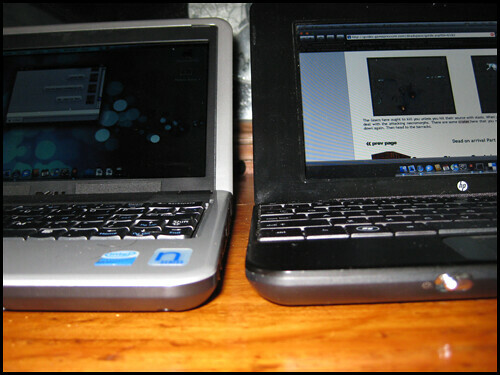 They're about the same thickness, but the HP is a tad bit wider then the Dell. I believe it's that little bit that gives it the better keyboard. Overall I am quite impressed with the Dell Mini 9. If the keyboard had been a bit better, this truly would have been the ultimate OS X netbook. So, I guess now I've gotta get an MSI Wind and try it out on there? Haha. Here's to hoping that Apple just comes out with one.